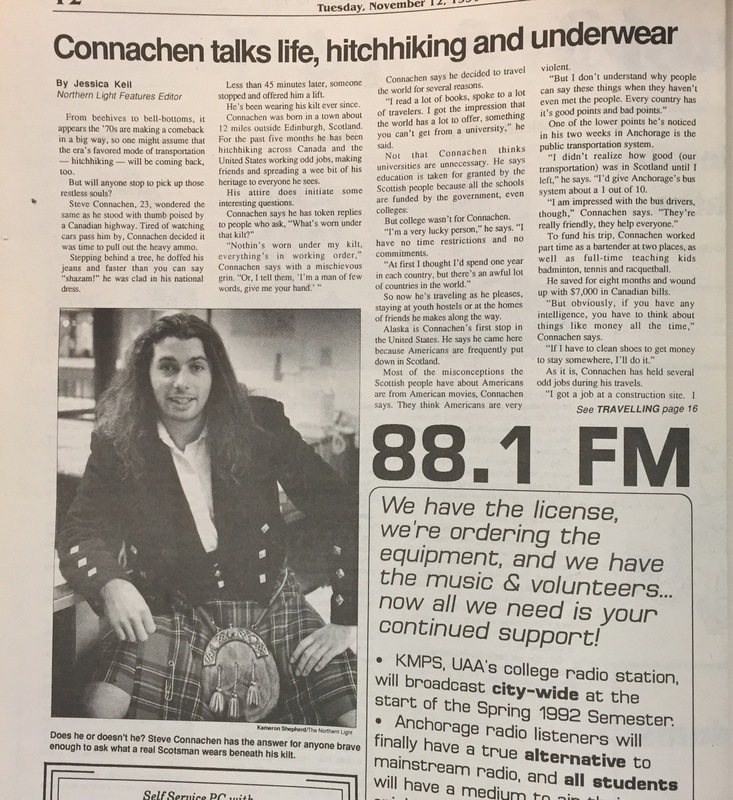 He’s been wearing his kilt ever since. Connachen was born in a town about 12 miles outside Edinburgh, Scotland. For the past five months he has been hitchhiking across Canada and the United States working odd jobs, making friends, and spreading a wee bit of his heritage to everyone he sees. His attire does initiate some interesting questions. Connachen says he decided to travel the world for several reasons. “I read a lot of books, spoke to a lot of travelers. I got the impression that the world has a lot to offer, something you can’t get from a university,” he said. Not that Connachen thinks universities are unnecessary. He says education is taken for granted by the Scottish people because all the schools are funded by the government, even colleges. But college wasn’t for Connachen. “I’m a very lucky person,” he says. “I have no time restrictions and no commitments. So now he’s traveling as he pleases, staying at youth hostels or at the homes of friends he makes along the way. Alaska in Connachen’s first stop in the United States. He says he came here because Americans are frequently put down in Scotland. Most of the misconceptions the Scottish people have about Americans are from American movies, Connachen says. They think Americans are very violent. One of the lower points he’s noticed in his two weeks in Anchorage is the public transportation system. “I didn’t realize how good (our transportation) was in Scotland until I left,” he says. I”d give Anchorage’s bus system about a 1 out of 10. To fund his trip, Connachen worked part time as a bartended at two places as well as full-time teaching kids badminton, tennis and racquetball. He saved for eight months and wound up with $7,000 in Canadian bills. “But obviously, if you have any intelligence, you have to think about things like money all the time,” Connachen says. As it is, Connachen has held several odd jobs during his travels. “I got a job at a construction site. I didn’t even know how to pull a nail out, I’ve done mostly physical labor. “But it’s amazing how fast your vocabulary can diminish. When I went back to the youth hostel at night I used some words that weren’t really appropriate,” Connachen says. Connachen says he has learned many things about human nature from his travels. 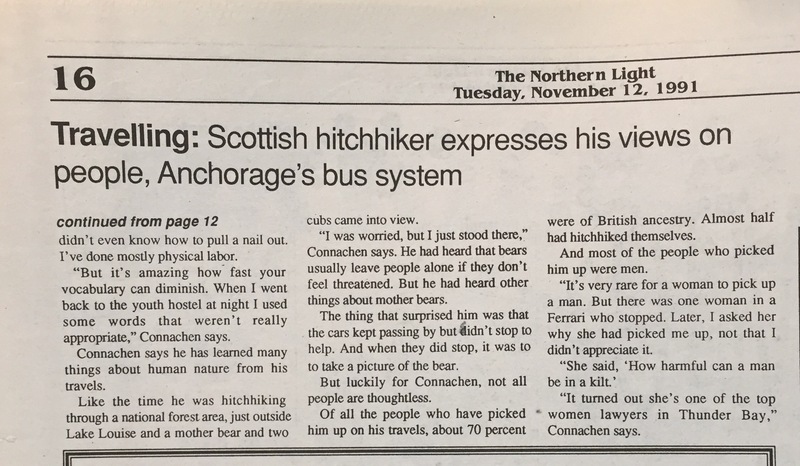 Like the time he was hitchhiking through a national forest area, just outside of Lake Louise and a mother bear and two cubs came into view. “I was worried, but I just stood there,” Connachen says. He had heard that bears usually leave people alone if they don’t feel threatened. But he had heard other things about mother bears. The thing that surprised him was that the cars kept passing by but didn’t stop to help. And when they did stop, it was to take a picture of the bear. But luckily for Connachen, not all people are thoughtless. Of all the people who have picked him up on his travels, about 70 percent were of British ancestry. Almost half had hitchhiked themselves. And most of the people who picked him up were men. “It’s very rare for a woman to pick up a man. But there was one woman in a Ferrari who stopped. Later I asked her why she had picked me up, not that I didn’t appreciate it. “It turned out she’s one of the top women lawyers in Thunder Bay, Connachen says.